Denon's DL103 is one of the real survivors of hi-fi - it first appeared on record players about the same time as The Beatles. But, from time to time, Denon unveils a variant on the 43-year-old design and here's the latest. The changes are basically to the generating coil, which uses 'six nines' copper (99.9999% pure) in a slightly different winding arrangement from the basic DL103. This results in a slightly lower output voltage from a considerably lower source impedance. The actual numbers are 0.25mV from 14 ohms. In power terms, this results in a slight gain in output, though you'll only derive any benefit from that when using an optimally matched step-up transformer. Mechanically, this is absolutely the standard item, with a bulky, squared-off plastic body, medium weight at 8.5g, and a long aluminium cantilever, linking diamond to generator coil. The stylus has a round profile, which in principle is a bit of a limitation on ultra-high frequency tracing ability, though plenty of long-term 103 users don't seem to find it very worrying in practice. We've plenty of affection for the DL103 and are delighted to find that the new R version preserves its excellent bass, imaging and lower-frequency precision, while adding an extra level of insight across the band. This all helps to plumb new depths in familiar discs. 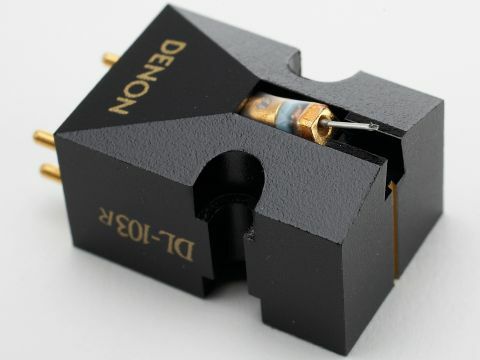 There's still some slight roughness in the treble when comparing the cartridge with references (including Denon's own DL304 - for some, the best cartridge available irrespective of price), but that's less obvious with high-energy music, where the 103 has always scored very highly.